There is an old piece of wisdom which says, "you find out who your friends are when you need them." Judi Joba found out she had a lot of friends after she was involved in a serious automobile accident. On July 17, Joba and two friends were hit by another vehicle. Of the 10 involved in the wreck, five died. Joba was taken to the hospital in Deadwood, S.D. Her neck was broken. Twelve ribs were broken, including the one which punctured her lung. She had a fractured ankle and a fractured right hand. "I didn't know anything for several days," Joba said. "I've got so much metal in me, I'll be worth more after I'm cremated." Her sense of humor is still in place. Joba left the hospital Sept. 2. "I was amazed so many friends helped," Joba said. "They came from everywhere. The generosity and love has been overwhelming." A lot of help was needed. Joba is a riding instructor at her facility Eagle's Ride Equine Center in Piedmont, S.D., near Rapid City. There were 13 horses to care for at her home, including boarded ones, schooling horses and her own. "I was on my way to meet my church pastor," Melissa Stetser said. "She called and told me to go straight to the hospital because Judi had been hurt." Stetser has been friends with Joba since she began looking for a riding instructor for her four-year-old son. "He showed a special ability with horses," Stetser said. "When we started looking for a teacher, most didn't want to take a four-year-old kid. Judi was recommended to us and she started teaching him." The son's name is Michael. He is 10 years old now, and still Judi's student. "They call me their fairy god mother," Joba said. "He (Michael) loves doing the ground work as much as riding." Stetser was concerned no one might have taken care of the horses in nearly 24 hours. "I started making phone calls," she said. "I got hold of a couple of girls who had ridden there and they went out to check. 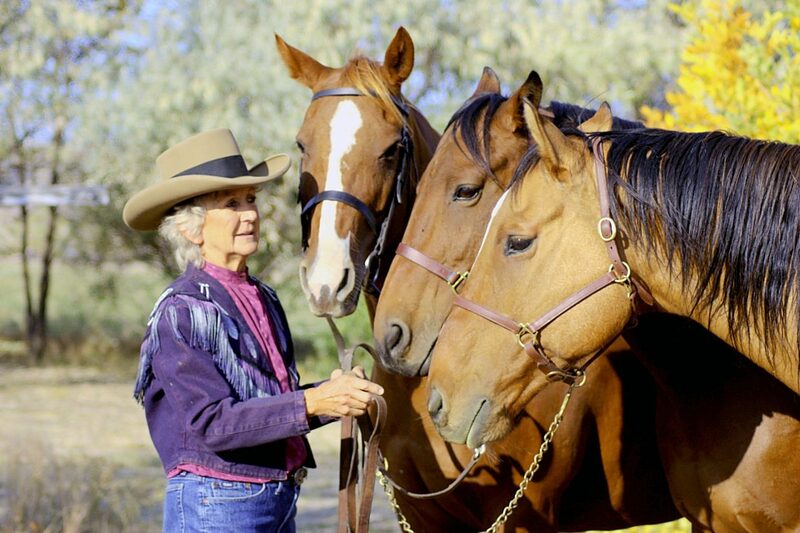 The neighbors had taken care of the horses that night (of the accident), and they continued to help." Stetser stayed with Joba in the hospital every day. It is about a 45-minute trip one way. "I'd drop the kids at school and go to the hospital," Stetser said, "then I'd be back to pick them up after school, feed them dinner, and the next morning start all over again. "I don't think she realized the effect she's had on so many people. Even the doctors and nurses in here. One of them is always coming by to say they know her, or someone she has taught." Joba is a life-long horseman. She has degrees in animal science and education from Michigan State University, along with a master's degree in education. She is certified as an education counselor. She is a licensed therapist and part of her business is equine-assisted therapy. She gives riding lessons to all ages, teaching dressage principles which may be applied to all styles of riding. In her showing days, she rode a half Arab gelding to a top 10 spot at the Arabian Nationals. She judges shows and holds clinics. "She can take care of herself mostly now," Stetser said. "She's up on her feet. The doctors at Deadwood rigged up a platform on a walker where she can lay the arm with the fractured hand and hold on with her other hand. She was working on stairs today. "The therapists at the hospital said every exercise they gave her she mastered ahead of time." Joba expects to be back in the pen instructing students within a month or two. "I bet she does, too," Stetser said. 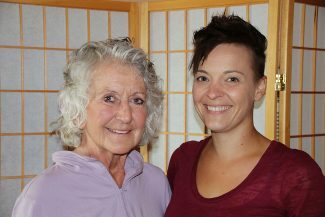 Another instructor has stepped in to work with Joba's students until she is back to work. Joba seems overwhelmed by all the people who have helped run her business while she recovers. "It's one of the biggest gifts I've ever received," Joba said. Stetser, a full-time studio photographer by trade, continues to show up every day. "I don't know if she adopted us or we adopted her," Stetser said, "but we're family. It's what you do."